I’ve spent the past 7 years working extensively with 3D printing, everything from low-cost hobby level printers to very high end plastic and metal 3D printers. I’ve been exploring the elusive space in between, using low-cost printing to serve enterprise and volume production applications. I’ve experienced first-hand how the low cost and high quality of 3D printed parts can change the world. Here’s my take on the next 5 years in 3D printing. Existing applications will become cheaper and more accessible. 3D printing will start to encroach on other technologies for some use cases. By far the most important change over the course of the next 5 years will be the decline in cost of 3D printing. This is likely to be a consequence of what has been dubbed the fourth industrial revolution. you can find out more about this by searching what is the fourth industrial revolution online. Moreover, this will be driven by newcomers to the industry, many of them coming from the low-cost segment of the industry. This dramatic reduction in cost will shift 3D printing from high value, high cost, low volume applications to low cost, high volume applications. Cost reductions will affect machines, labor cost and materials. On the left, two generations of Stratasys 3D printers, the Fortus and F123, all with heated chambers and soluble support. In the middle, the Replicator2X and Z18 are 4th and 5th generation Makerbots. On the right, competitive low-cost printers built for robust applications. It is worth pointing out that that the Raise3D N2+ has a build volume comparable to the Fortus 450mc, dual extruders and network control – for 1/40th of the price. Open intellectual property: Not only have some key patents expired, but a lot of innovation in 3D printing follows Open Source principles. This makes it easy for companies to get started without having to reinvent the entire process. Competition: More companies are entering the market, in part because of the open IP mentioned above, but also because of growth expectations. Manufacturing is a much bigger market than prototyping! Reduced cost of computation: 3D printing requires considerable application of computer power, from design all the way through printing. Significant improvements in performance can be achieved by advancing the software. Moore’s law and the consequent availability of more compute power allows for much much better software on inexpensive systems. Crossover from other industries: A major factor is the reduction of cost in key components that are shared with other industries. For example, ARM microprocessors and sensors are used in cellphones, motors and motion control are used in desktop paper printers, and LCD imagers (for SLA machines) are used in cellphones. The volume of business in these other industries drives costs down. The more expensive machines achieve higher quality levels. This is no longer true. Prints from low-cost machines in equivalent materials perform and look the same (or better) than the expensive machines. In any case, quality can be defined as fitness for purpose, and this can certainly be achieved. The more expensive machines are more reliable. No longer true – a survey of various organizations using low-cost printers in relatively high-volume applications showed near 95% successful job completion. Moreover, the lower cost machines allow for greater redundancy. The expensive machines have a well developed dissolvable support system, so they can print complex geometries more easily. This is true, in terms of a polished workflow: however, even low-cost dual-extrusion machines can use soluble supports. Further, as low-cost machines become available, there is an incentive to adjust the geometry to the capability of the machines, removing the need for support altogether. The more advanced machines have a heated build chamber that lets them work with materials such as ABS and ULTEM. ULTEM is probably out of reach for the low-cost machines, but ABS is certainly possible. The other interesting development is that low-cost machines are easier to use with new plastics that are not subject to warping, and hence don’t need the heated chamber at all. I have shifted to using Colorfabb nGen almost exclusively, a filament made from Eastman Amphora that does not warp and has similar performance to ABS. It has other advantages too. Finally, more expensive machines have been able to handle larger parts. This is partly because mechanisms don’t scale linearly, larger mechanical systems are proportionally more expensive if they need to maintain precision and accuracy. However, there are ways around this: Autodesk’s Project Escher gangs multiple low cost mechanisms to build large parts quickly, while the increasing use of closed loop control and positioning systems allows for high precision over large parts. Form Labs has announced the Fuse 1 SLS 3D printer, a process that fuses nylon powder with a laser. At $9,999 ($19,999 with cleaning station) it costs 1/20th as much as a comparable printer from an established supplier. Wanhao is shipping the D7, an SLA 3D printer, using a process where exposure to UV light hardens a liquid resin. The D7 costs $528 and delivers incredibly good results. A key part of the cost saving is using technologies borrowed from the smartphone market (LCD screens) for the curing light source, instead of expensive lasers or DLP projectors. Desktop Metal and Mark Forged have both announced 3D printers capable of producing objects in various kinds of metal, both taking advantage of materials originally developed for Metal Injection Molding. These machines are between 1/10 and 1/20th of the cost of typical metal 3d printers. Using soluble support on an inexpensive printer. ABS with HIPS support. Cost reduction opens up more possibilities than doing the same things more cheaply. Since the machines are so much cheaper, it is possible to build a cluster of machines, and achieve 40x the throughput of a single machine. Labor costs are spread over a much larger number of parts, so business models change. Stratasys is working on this front with their Continuous Build Demonstrator, but so are other players like Type A Machines. Robotic automation as a complement to 3D printing will also be a huge trend. Companies like Voodoo Manufacturing are deploying robots to automate production at their facility, which houses 160 3D printers. 3D Systems showed off its Figure 4 automation demonstrator. Form Labs has shown off its Form Cell system, for managing multiple SLA printers. Finally, we are seeing massive declines in material prices. Traditional 3D printing vendors have been able to charge very high prices for materials, in exchange for guaranteeing results and performance. However, these material prices, while acceptable for prototyping, are unacceptable for volume production. Most of the growth in printer sales is from machines that can use commodity filaments, which are subject to much greater competitive pressures. In addition, the development of polymers specifically designed for 3D printing makes it possible to make less expensive machines (ie by suppressing the need for a heated build chamber). All three of the major cost factors in 3D printing are declining, by orders of magnitude: machine cost, labor, materials. It is possible to imagine a 100x reduction in cost per part in the near future. But what does this mean for applications of 3D printing? Traditionally 3D printing applications were very low volume and high value, such as prototyping or highly specialized manufacturing. Printers were complex and elaborate in order to avoid restricting designers, but also because there was very little cost pressure! In the short term, the dramatic reduction in cost means that existing applications will become more widely accessible. This has already happened: small design & engineering shops have their own 3D printers and desktop 3D printers are ubiquitous at hardware startups. 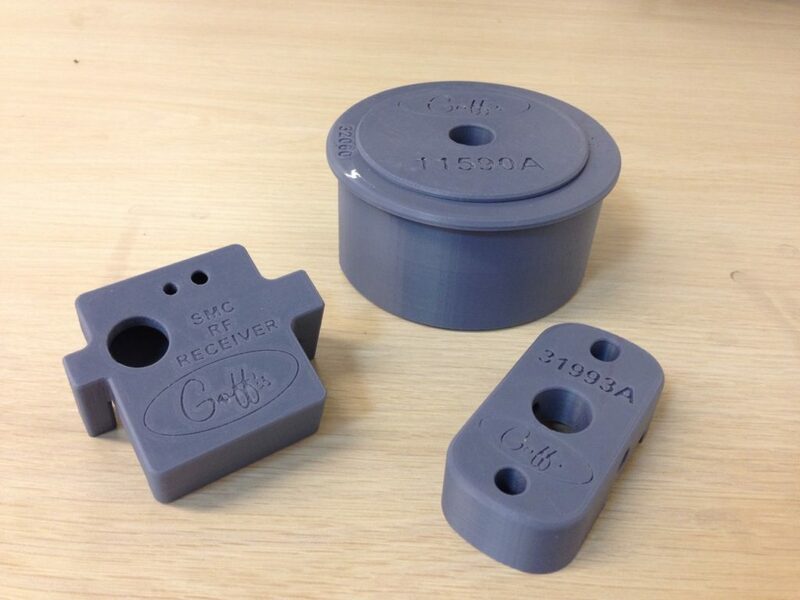 Other applications, such as industrial jigs and fixtures, are also quickly adopting low-cost 3D printing. The high value / low volume market segment cannot be considered a stronghold for traditional 3D printing companies. There is no reason that high value applications can’t be served by low cost processes: for example, doctors 3D printed bones from CAT scan for use in preparing for surgery, and they used a $300 printer! However, at the other extreme, injection molding dominates the market for low cost / high volume production. It is still very hard to beat for very high volumes, since the cost of tooling is spread over many parts. However, as volumes drop, 3D printing becomes more competitive. 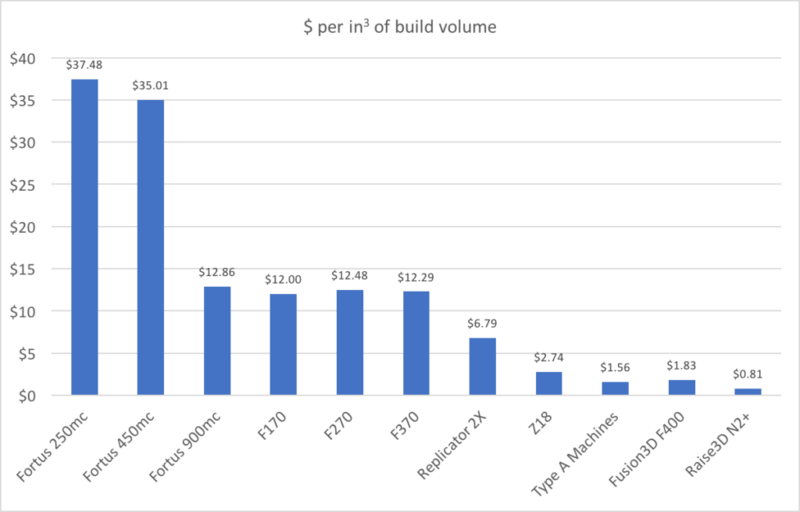 Some white papers argue that for volumes ranging from 1,000 to 10,000 parts, 3D printing is already competitive. However, there is still an unexplored market space: the “Great Unknown” in my chart above. 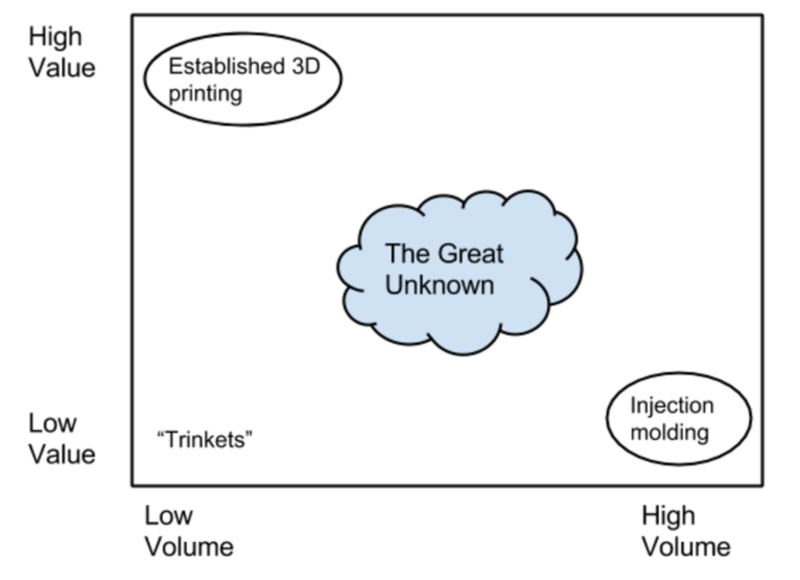 These are applications of insufficiently high value to have been addressed by 3D printing so far, but with volumes not high enough to justify injection molding. Since they have not been feasible, no-one has explored them. However, the increasing prevalence of 3D printing in the design and startup worlds means that designers familiar with their capabilities will soon start coming up with ideas. Andreas Bastian of Autodesk goes into the relation between design and 3D printing in far more depth. What are the characteristics of these applications? Hydrabarrier: This company makes water damage containment systems, which require an adapter to allow filling with a common garden hose. Total yearly volume of these adapters is in the 100s, which would not justify cutting a mold for injection molding. (The interior thread requires a complex mold). 3D printing allows demand to be met as needed. 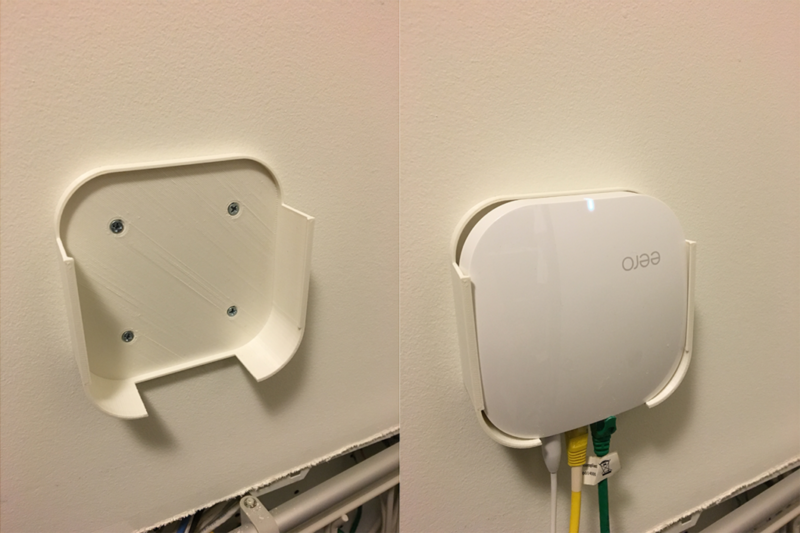 Wall mount adapter for Eero WiFi: This new mesh networking system can be placed almost anywhere, but some users require a good way to attach them to walls or ceilings. This bracket (which I designed) fits the bill. Volumes are not high enough to justify mass production. However, distributed 3D printing (through 3D Hubs) works perfectly – and generates a surprising amount of revenue. Goff Curtain Walls: This company makes industrial curtain walls. Many of their installations are customized, and require specialized parts. They have a very large catalog of parts, of which few are used in a given year. Injection molding was out of the question, and machining was extremely costly, but low-cost 3D printing turned out to be perfect. Parts were redesigned for 3D printing, which made them even more cost-effective and improved performance. 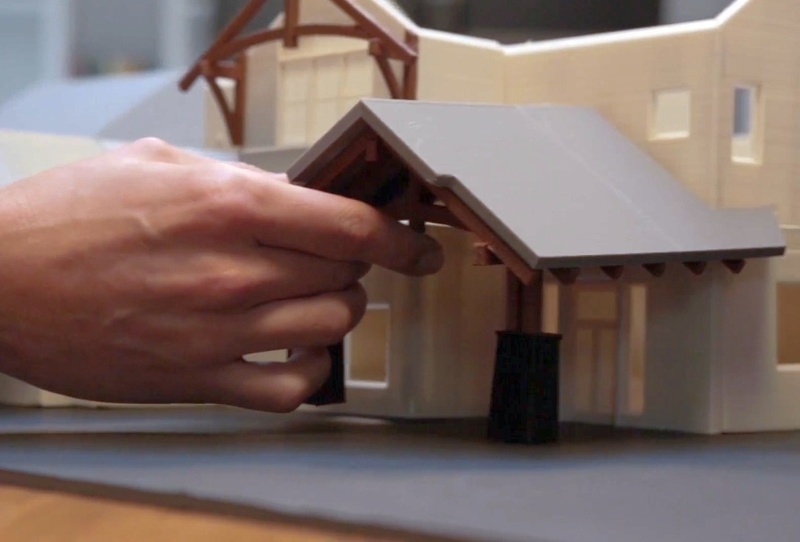 Architectural models for on-site use: Building models are expensive to make, and are generally used for client presentations. However, software like hsbmodel allows good quality models to be made inexpensively, which opens up a new application area: models for use at a building site to guide construction crews. All or part of the model can be 3D printed and sent to the job site. To sum up – the major factor affecting 3D printing over the next 5 years will be reduction in cost. This is will change business models for the 3D printing industry itself, but also for users of 3D printing, who will see greatly expanded possibilities and opportunities.